@yas Hi Yasaar! I am pleased to meet you. And what a beautiful kitty you have! Will you both be at the conference this year? Hi Kerry, Valentine’s mom! Great to meet you. Yes, I will be there but kitties stay at home with their cat daddy! I have ten kitties, the one in the photo with me is Jimmy “Fancy Feet” because he’s polydactyl 🙂 The one in the header is Mr. Jack. Looking forward to meeting you at the conference! Oh yes, that’s right! 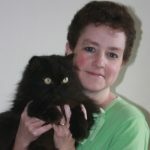 You have many beautiful kitties & such a cute blog! Are you arriving on Wed or Thurs? I arrive late Wed, so hope to start bright and early at the conference on Thurs. Val will be holding down the home fort, though I wish I could bring him. I just don’t want to put him on an airplane & he hasn’t traveled before. I also arrive Wednesday afternoon if all goes well. I’m sure Val would be happy in his comfy home rather than travel. But I’m sure he’ll miss his mommy!